This is my last post on my recent trip to Cambodia and Thailand. I am so happy that the day before I go back to Singapore, I managed to eat in this place that is new to me. 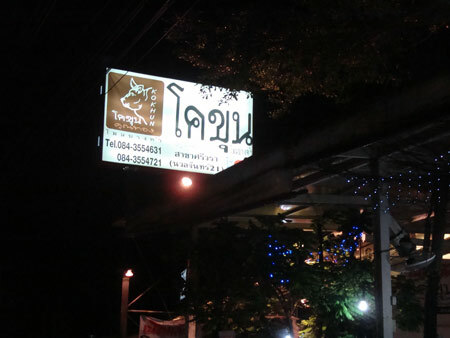 The name of the restaurant is Ko-Khun. The restaurant is famous for it’s beef dishes. 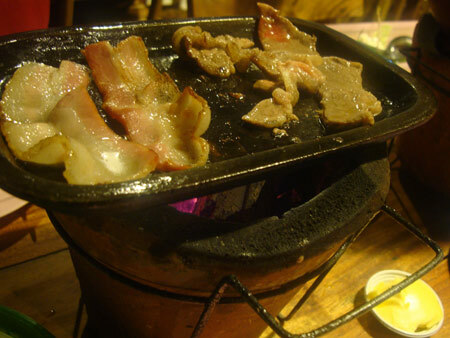 Mainly hot plate beef where you can order different cuts and grill it yourself on the hot plate. 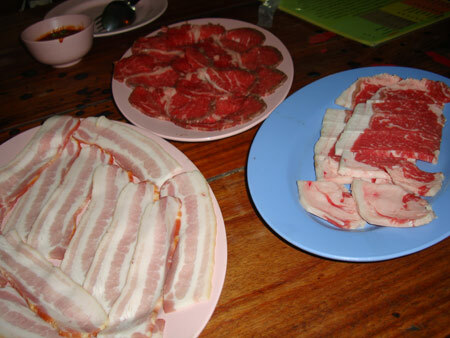 According to a Thai friend of Zach, the beef comes from a certain area in Thailand. 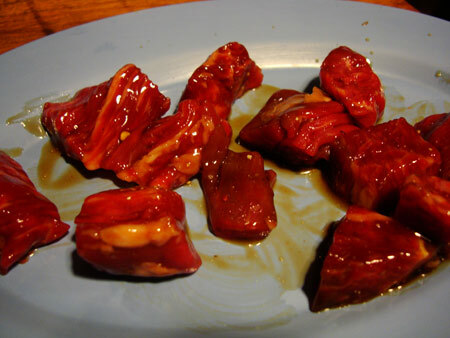 Maybe is something like how Kobe, Japan is famous for it’s beef and so is Batangas, Philippines. I’ve been to Thailand so many times for the past 10 years but there’s always places that are new to me. This is why coming back to Thailand over and over again will not get old. I am so glad that Zach saved this for my grand finale meal. 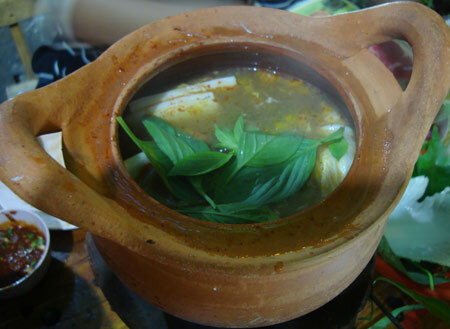 I got so excited upon hearing that Ko-Khun is the type of restaurant where you have to cook your own food. 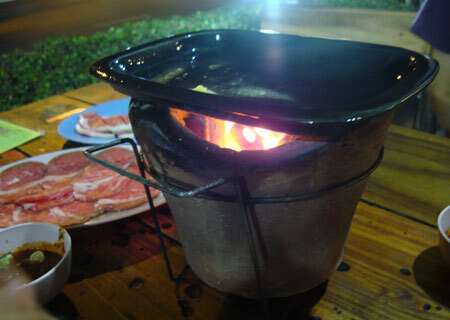 Like hot pot in MK or BBQ Plaza. One thing appeals to me about Ko-Khun is that we dine in open air. 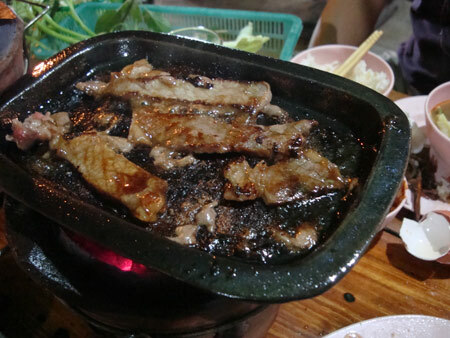 The place is not really foreigner friendly but the menu however has pictures of certain cuts of beef with prices on it. Zach has never been here himself but his Thai friend highly recommended this place to him. We didn’t waste anytime and started point at the food that we wanted and with our halting Thai language, we managed to get our orders across. 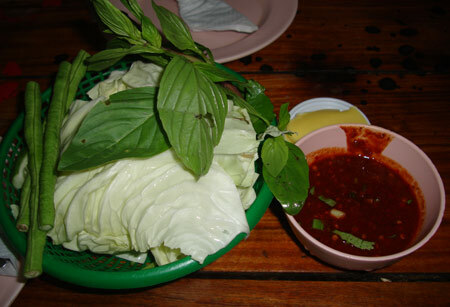 After we placed our orders, the staff brought us our serving plates, chopsticks and this basket of vegetables accompanied with 2 bowls of special chili sauce. I immediately took the long beans and dip it into the chili sauce to taste it. The chili dip is really good and my saliva starts to build in my mouth imagining dipping those grilled beef into it. Can’t wait for the feast to begin. 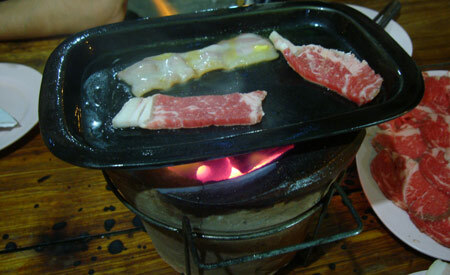 Next to arrived was the grilling plate on burning charcoal together with the raw cut of beef. We put some butter on the grilling plate and start to grill our beef. 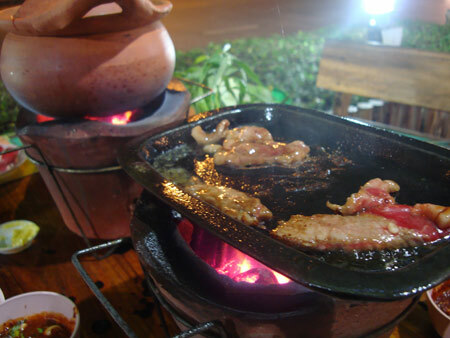 Since you are the one who cook your own meat, is up to you if you like your beef well done, medium rare, medium or rare. We also ordered some bacon as we love swine a lot. If only my departure tomorrow wasn’t on an early morning flight, I would have ordered a bottle of wine. That way we can SWINE AND DINE. Lol. 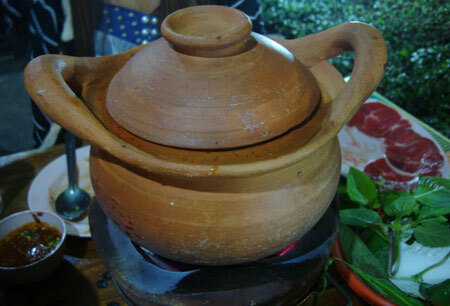 As we were grilling, I noticed our next table, a group of Thai customers has this claypot on their table. We asked the waiter what was that and he told us it was some spicy and sour soup dish. We can put in our beef and vegetables to slow cook it. Egg and some glass noodles will be provided myself. What happened next was we ordered it too. This was my last night in Bangkok, Thailand anyways. The spicy and sour soup was unbelievable delicious and appetizing. We put some thin slice of beef, add in cabbage, long beans, Chinese cabbage, some minty leaves and break an egg into the soup. Being an Asian, I had to order a bowl of rice to have the maximum pleasure of savoring this soup. I’m glad that I ordered this soup dish. Just look at this picture. I bet it just made you swallow your saliva. I can’t tell you how much i enjoyed the experience dining here. I can’t stop looking around at tables around us. 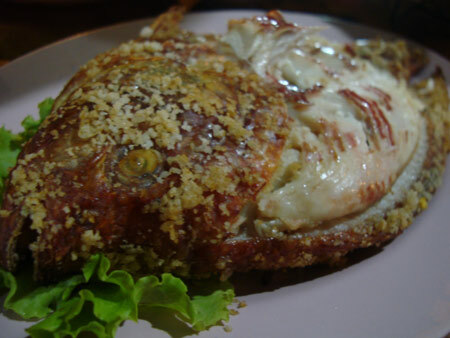 I want to see what the Thai people are ordering and I want to get the same too if the dish appeals to me. I saw a few tables away that some customers were having some fish. We ordered it too and I can tell you it was pure heaven dipping the fish meat into the chili sauce. Even after ordering so many different cut of Kho-Khun beef, we ordered the most expensive cut of all. I think this is the special marinated sirloin meat that cost around 220 BHT. I think this is the tastiest of all the cuts of beef. We were so full after devouring all the food that we ordered that night. Is not the first time that we experienced this over eating situation. Being experts in gluttony, we just sat for a while and ordered for the bill. The bill came to about 920 BHT. The food was amazing and now even the price was unbelievable. I swore if we still have space in our stomach, I would order some food again. I will leave Thailand a happy man but I will definitely be back soon.